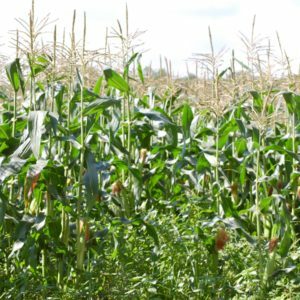 Inspired by my quest to enjoy the sweet corn this summer which is really at it’s height of flavor I’ve continued to explore using corn in different recipes. 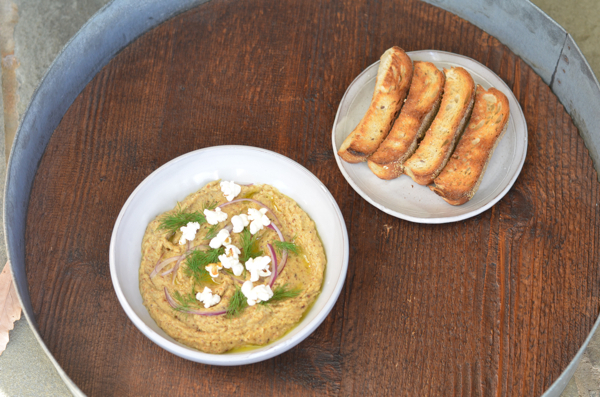 This roasted sweet corn hummus has become an instant favorite. It’s also the perfect way to use any leftover corn you might have after a meal, that said don’t wait for leftovers, this recipe is one you will want to try immediately! I was looking for the perfect balance of corn, chickpeas and tahini … 4 ears of corn is perfect to achieve a strong taste of corn in every bite – but the recipe is forgiving so feel free to adjust based on the amount of corn you might have available. From by the bay, wishing you sweet corn food memories! Preheat oven to 425 degrees F. Wrap corn in a piece on aluminum foil , place on a baking sheet and in the oven for 30 minutes. Remove from oven and take corn out of the foil and place directly on the rack in the oven for another 15 minutes. Remove from oven and cool. Cut kernels off the cob and place half of the corn, into a food processor. Add remaining ingredients and blend until smooth. Reserve 2 tablespoons of the fresh corn kernels and place remaining corn into the food processor. Blend until corn is not quite smooth, so there is some texture to the hummus. Place in a covered container and chill for two hours before serving. To serve place in the shallow bowl. Drizzle hummus with olive oil, sprinkle remaining corn kernels and a touch of coarse sea salt. 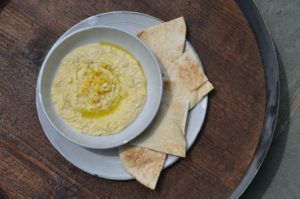 This entry was posted in appetizer and tagged corn recipes, cumin recipes, hummus recipes, lemon recipes, roasted sweet corn hummus, summer recipes, tahini recipes on August 21, 2017 by entertainingbythebay. It’s not even summer yet and we are about to have our second heat wave starting Sunday! 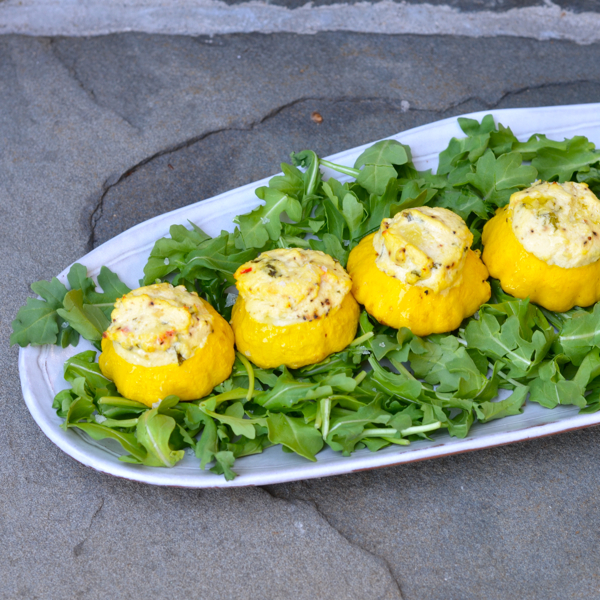 During the last mini heat wave I wanted to serve a side dish that was cool and refreshing. 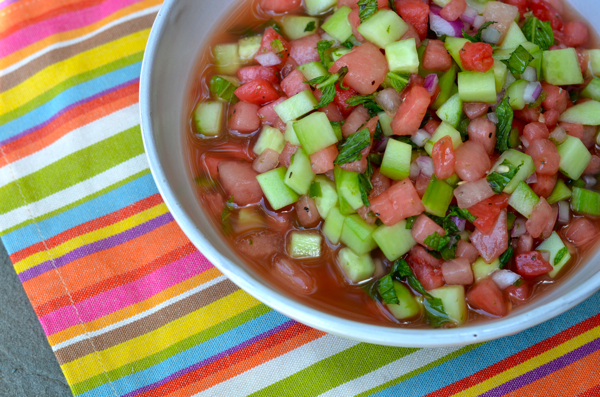 It turns out that watermelon and cucumbers are a perfect pair. I served this salsa along with grilled fish tacos, but this side is so versatile it complements most fish, pork and chicken. Oh, and let’s not forget a perfect salsa for dipping a tortilla chip. 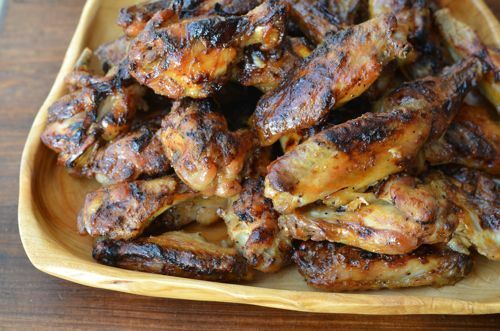 It’s a must try recipe! From by the bay, wishing you cool food memories! In a medium size bowl combine the honey, lime juice salt and pepper. Mix well. Add the remaining ingredients and toss gently. Cover and refrigerate until ready to serve, up to 1 day. This entry was posted in appetizer, fun Foods and tagged cucumber recipes, lime, mint, salsa recipes, watermelon and cucumber salsa, watermelon recipes on June 9, 2017 by entertainingbythebay. 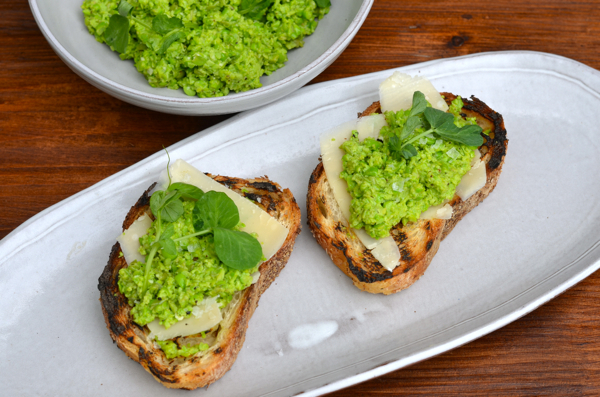 To continue the spring vegetable celebration, find some young green peas and make this vibrantly bright green sweet pea pesto. Young peas are the taste of spring. Crunchy, peppery, sweet. 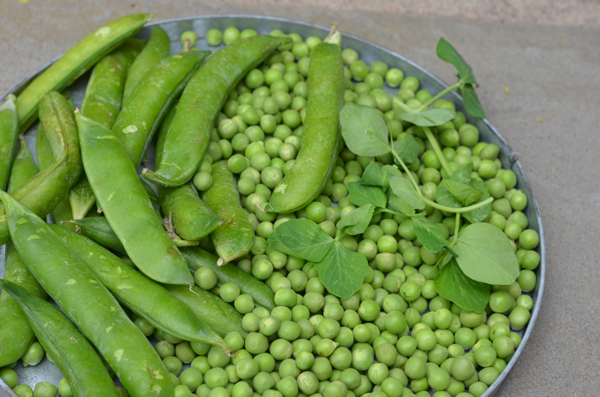 Young peas are not starchy, they are crisp, fresh and slightly sweet. 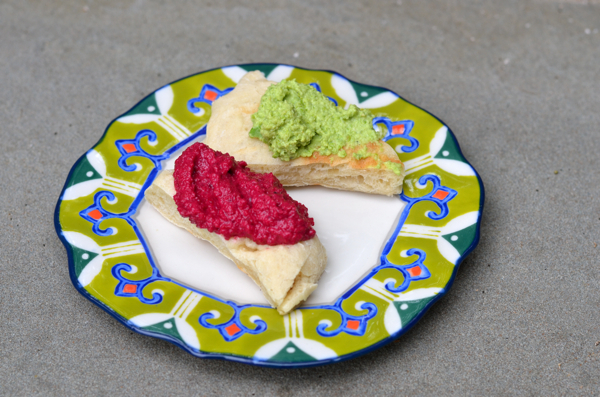 I’m using this sweet pea pesto as an appetizer, but you can also make a wonderful salad with leafy greens including young pea shoot leaves , toss with your favorite vinaigrette, then add a few dollops of fresh ricotta cheese and sweet pea pesto. It’s the perfect spring salad. From by the bay , wishing you bright spring green food memories! Boil salted water in a medium saute pan. Blanche the peas in boiling water until the peas start to turn bright green, 10 to 20 seconds. Place in cold water to cool. Remove from water and pat dry. Place peas in food processor. Add cheese, lemon juice, salt, pepper and process until well combined, you want the peas to have some texture. Slowly pour olive oil to combine. Place in a covered glass jar. Store in the refrigerator until ready to use. Serve at room temperature. To assemble the crostini – take the grilled bread, top with shaved parmesan, sprinkle with Maldon Sea Salt and finally top with a sprig of young pea shoots. This entry was posted in appetizer and tagged lemon recipes, parmesan recipes, pea recipes, pesto recipes, sea salt, sweet pea pesto crostini on May 1, 2017 by entertainingbythebay. 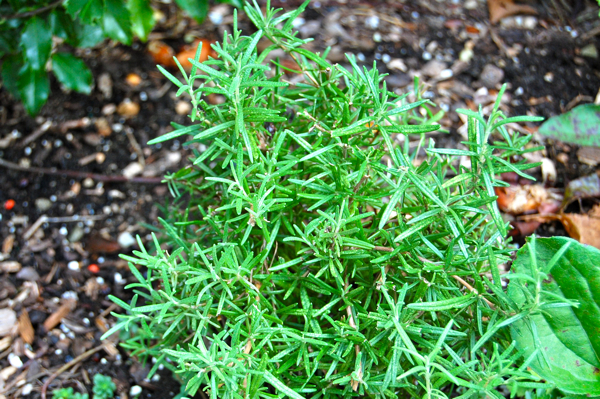 Rosemary is one of my favorite herbs. I love the taste, aroma and look of rosemary. This is my must have herb that I use over and over again while cooking. It’s especially nice that rosemary also offers some health benefits as well. 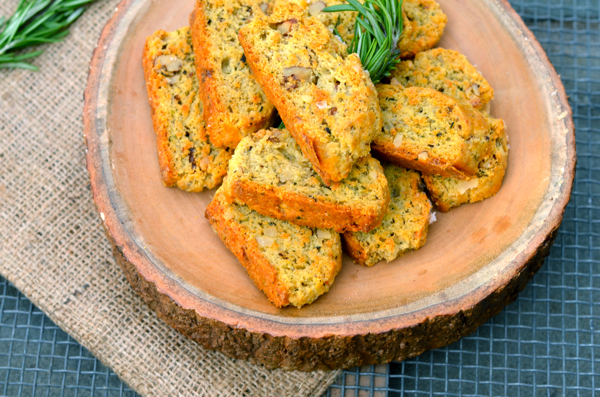 This recipe is a delicious change up on the traditional biscotti. It’s a savory version prepared with rosemary, parmesan cheese , walnuts, cracked black pepper and fennel seeds. This biscotti is perfect served with a runny cheese and a glass of wine for cocktails or on the side of a green salad , soup or omelette. You’ll love the taste! From by the bay, wishing you rosemary flavored food memories! an evergreen shrub, Rosmarinus officinalis, part of the mint family, which is native to the Mediterranean region, having thick, narrow leaves and pale-blue, bell-shaped flowers, used in cooking to flavor foods, as well as used in perfumery and medicine. Rosemary is a traditional symbol of remembrance. Rosemary has several health benefits. Some of the benefits are reducing anxiety, elevating mood, boosting memory, offering brain protection, pain relief, headache relief and anti-inflammatory. Preheat the oven to 350 degrees F. Line a baking sheet with parchment paper. Place the peppercorns and fennel in a spice grinder and pulse until coarsely ground. In a bowl, mix together the flour, baking powder, fine sea salt, rosemary, fennel and pepper. In a separate bowl, using a mixer, beat the butter until light and fluffy. Add three of the eggs one at a time, mixing well between each addition. Add the cheese and nuts and mix well, then add the dry ingredients until the mixture just comes together. Divide the dough into two equal pieces and with floured hands roll into logs to a length of about 12 inches and width of 1 1/2 inches. Whisk the remaining egg and brush it over the dough. Place logs side by side on the baking sheet. Sprinkle the logs with the coarse sea salt, and bake for about 30 minutes or until the logs are light brown and firm to touch. Remove from the oven and allow to cool 20 minutes on a rack. Using a serrated knife, cut the logs into 1/2 inch slices and arrange the slices cut side down on the baking sheet. Return to the 350 degrees F oven and bake for an additional 5 minutes. Turn, and bake another 5 minutes or until firm to the touch. Cool completely before storing. This entry was posted in appetizer, cookies, desserts and tagged baked goods, biscotti recipes, cracked black pepper recipes, fennel recipes, parmesan recipes, rosemary recipe, savory rosemary parmesan biscotti, walnut recipes on March 7, 2017 by entertainingbythebay. 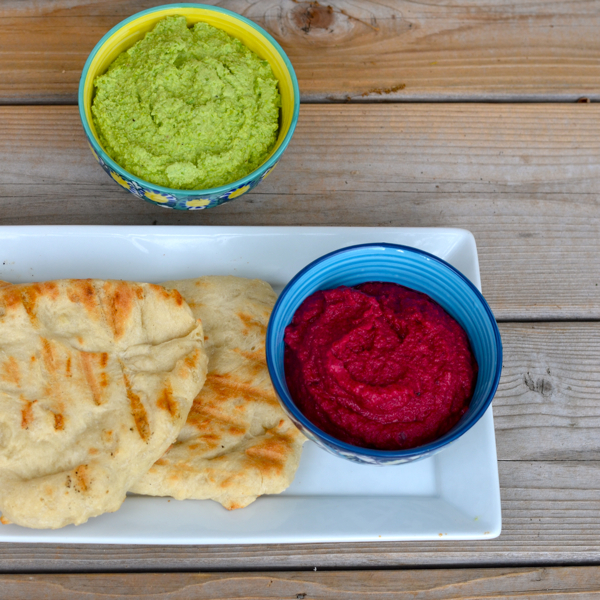 Inspired by all the cauliflower dishes on menus today and the great appreciation of a vegetable that for many years was out of favor, here is a delicious hummus celebrating cauliflower! It’s brightened with lemon juice and given texture with the use of several garnishes. The most interesting garnish being popcorn. I think it’s a great idea to make enough popcorn to not only garnish the hummus but to serve along to guests. If you don’t want to serve popcorn you can easily pop some corn in a small sauce pan with a cover over medium heat just adding a few dried kernels and cover. 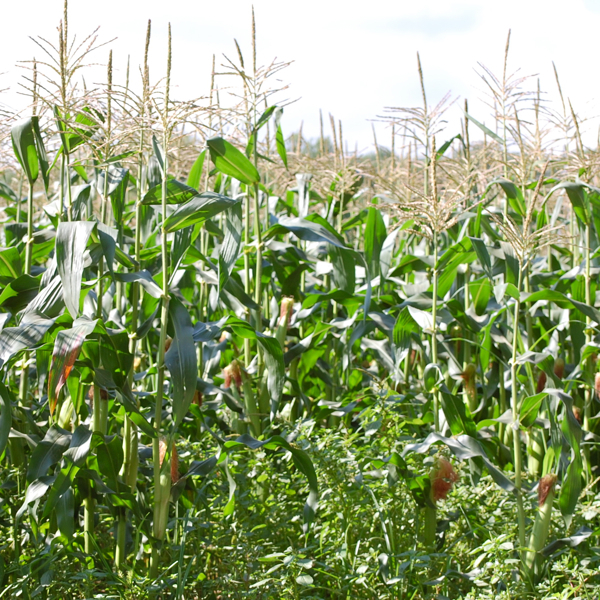 Shake a few times to ensure the corn does not burn, you’ll know when it’s ready by listening carefully to the corn popping. I like to serve this along with a nice toasted multi-grain bread. From by the bay, wishing you warm cauliflower food memories! Preheat oven to 400 degrees F. Toss cauliflower with 2 tablespoons olive oil. Place on a baking sheet in a single layer and roasted in the oven until cauliflower starts to caramelize and is soft, approximately 30 to 40 minutes. Remove from oven and let cool. In a small dish add the red onion and red wine vinegar and mix. The vinegar will softened and pickle the onions. Once the cauliflower is cool add to a food processor along with the tahini, olive oil, salt, pepper and lemon juice. Process until smooth. Taste to adjust for seasoning. Serve at room temperature or keep refrigerated until ready to use. Garnish with pickled onions, pumpkin seeds, popcorn and dill. Serve with toasted multi-grain bread. This entry was posted in appetizer and tagged cauliflower recipes, dill recipes, fall recipes, hummus recipes, lemon recipes, popcorn, pumpkin seed recipes, red wine vinegar, roasted cauliflower hummus, sea salt, tahini on November 30, 2016 by entertainingbythebay. Loving this time of year and one of the best things available in early September is figs! I just picked up some Black Mission Figs at the market and was deciding how to prepare them, when my mother recalled some of her fond food memories about eating figs as a young child in Brooklyn. Her parents had a few figs trees in their small backyard. My grandmother prepared the figs with honey. I found this recipe from Emeril Lagasse , loving that the figs are roasted stuffed with blue cheese for a salty note and finished honey for additional sweetness. We loved this recipe, especially my mother remembering her childhood with this food memory! From by the bay, wishing you sweet fig food memories! Using a paring knife, carefully trim any tough portion of the stems from each fig. Rub each fig all over with extra-virgin olive oil, then slice down through the stem about 3/4-inch. Make a second cut perpendicular to the first cut, so that you have an X-shaped cut in the top of each fig. Gently pry the edges apart and stuff each fig with about 1 teaspoon of the Gorgonzola. 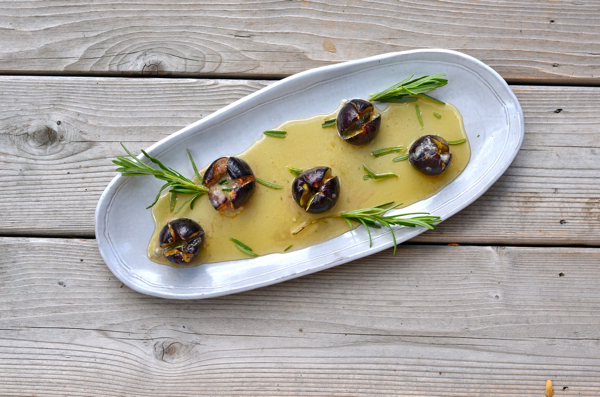 Place the figs upright on a baking sheet and bake until the figs are plump and shiny but have not burst, about 10 minutes. Drizzle equal amounts of the honey on each of 4 serving plates and place the figs on top of the honey. Sprinkle each plate with a pinch of the chopped rosemary and some of the remaining Gorgonzola. Serve immediately. 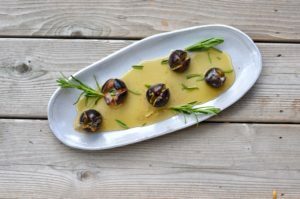 This entry was posted in appetizer and tagged blue cheese recipes, easy appetizers, fall foods, fall recipes, Fresh Roasted Figs with Gorgonzola, Greek recipes, honey recipes, rosemary recipes on September 16, 2016 by entertainingbythebay. 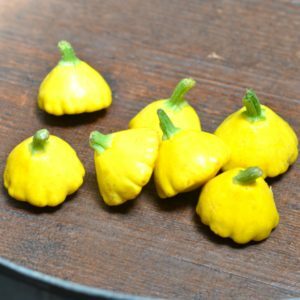 I love how cute pattypan squash looks. I can’t resist food this pretty and cute. So I found myself faced with a bag of pattypan squash along with the question, how should I prepare this sweet little vegetable. My answer was no further than preparing my favorite filling for zucchini flowers and adding an egg and some cheese to make it firmer. A quick bake in the oven and you have the perfect little appetizer. If you find tiny ones the stuffing will fill more than 12 , think of this as a summer version of a stuffed mushroom. Or you can serve slightly larger pattypans on a bed of lightly dressed greens as a first course, or a light summer lunch or dinner. Enjoy! From by the bay , wishing you cute pattypan food memories! To prepare squash rinse and cut off the tops with stem leaving approximately 3/4 of the squash remaining on the bottom. Use a teaspoon and gently scoop the flesh and seeds making a small circular hole. Make sure not to break the remaining outside of the squash. Preheat oven to 400 degrees F. Line a baking sheet with foil. In a small bowl mix the ingredients for filling until blended. Brush each squash with olive oil. Place on the foil lined baking sheet, sprinkle with salt and pepper. Use a teaspoon to fill each squash with cheese filling. Cover with aluminum foil and bake for 30 minutes. 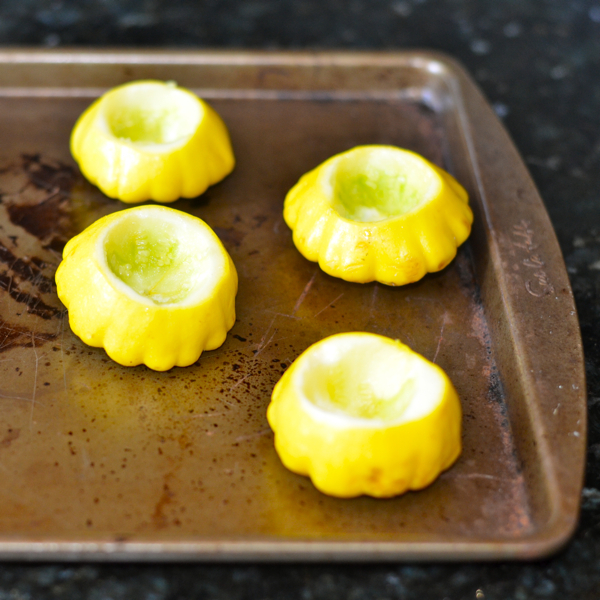 Remove the foil and bake for approximately 5 minutes longer to brown the tops of the filled squash. Remove from oven. Serve warm or room temperature on a bed of you favorite lightly dressed greens, such as arugula. Once the pattypans are assembled on the lettuce drizzle lightly with additional olive oil and sprinkle with flake sea salt. This entry was posted in appetizer and tagged mint, parmesan cheese recipes, pattypan squash, ricotta cheese recipes, ricotta filled pattypan squash, stuffed pattypan squash, summer recipes, thai red chile on July 22, 2016 by entertainingbythebay. This recipe combines some of the best aspects of Spring- early spring peas and celebrating Cinco de Mayo. I, unfortunately, can’t take credit for this vibrant combination of spring peas and avocados, Chef Jean-George Vongerichten serves this incredible dish at ABC Cocina in New York. He fortunately shared this recipe with Tasting Table and I’m passing it along. 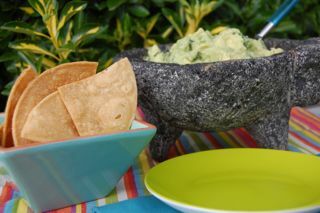 The few extra steps to make this guacamole is well worth the extra work, as it rewards in it’s outstanding flavor. Celebrate the season and the holiday this week ! From by the bay, wishing you sweet green pea food memories! 1. Fill a large bowl with ice and water. To a medium saucepan of boiling water, add the peas and cook until tender, 1 to 2 minutes. Add the whole cilantro leaves and cook just long enough to wilt them, about 5 seconds. Strain both the peas and cilantro into a fine-mesh sieve and plunge the sieve into the ice water to stop the cooking. Once the peas are cool, transfer them to a paper-towel-lined plate to drain. Place the cilantro in a few layers of paper towels and wring dry. 2. To a skillet set over medium-high heat, add the sunflower seeds and toast until fragrant and golden-brown, about 1 minute. Transfer the sunflower seeds to a medium plate. To the skillet, add the whole jalapeño. Cook, using tongs to turn it often, until the jalapeño is charred, 8 to 10 minutes. Transfer the chile to a small bowl, cover the bowl with plastic wrap and set aside for 5 minutes. Peel the charred skin from the jalapeño, remove the stem, halve the chile lengthwise and remove the seeds with the tip of a paring knife. 3. To the small bowl insert of a food processor (or using a small capacity food processor), add all but 2 tablespoons of the cooled peas, the blanched cilantro, the charred jalapeño and ½ teaspoon of the kosher salt. Pulse the mixture until it is coarsely chopped, about 20 one-second pulses. Transfer the pea mixture to a medium bowl. 4. To the peas, add the avocados, scallions, lime zest, lime juice and remaining 1 teaspoon kosher salt. Mash with a fork. Transfer to a serving bowl and sprinkle with the sunflower seeds, the remaining peas, the chopped cilantro and the pinch of sea salt. Serve with the tortilla chips. 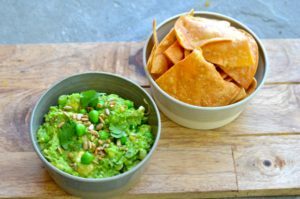 This entry was posted in appetizer and tagged avocado, cilantro, cinco de mayo recipes, guacamole recipes, jalapeno, pea, peas, spring recipes, sunflower seeds on May 4, 2016 by entertainingbythebay.